Fabricated by Stocklin Iron Works and designed by Nebolon, the orange staircase features steel railings and treads made from IKEA wood butcher blocks. “We designed the open staircase to make the trip to the second floor fun,” the architect says. 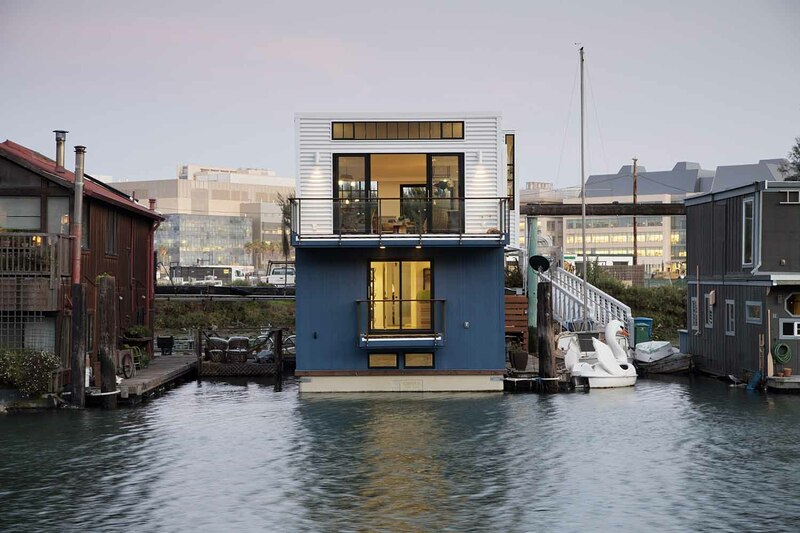 After being outbid on conventional homes, Kimo and Sarah Bertam decided to check out a houseboat for rent in the Bay Area’s Mission Creek on a whim. Both share a lifelong love of the water—Kimo is an avid surfer and Sarah spent childhood summers on a sailboat—and immediately were smitten with the place. The experience led them to embark on their own floating home project with local architect Robert Nebolon. While he’d never worked on a floating home before, Nebolon’s experience building houses near water and on piers made this opportunity feel like a natural progression. “The main challenge was determining how to pack the house with storage while ensuring it had the basics,” Nebolon says. Weight was also an issue. As a floating house, not a houseboat, it wouldn’t move after being moored to its final location. The sculptural, loft-like result ingeniously connects to its site. Inspired by the area’s industrial past, its sawtooth roof and sweeping views define and maximize space, while its door, staircase, and kitchen reference the Golden Gate Bridge with their orange hue. A trio of decks help the three-floor, two-bedroom home embrace life on the water. Oversized warehouse-style windows allow reflections of the water to constantly ripple across the ceiling.